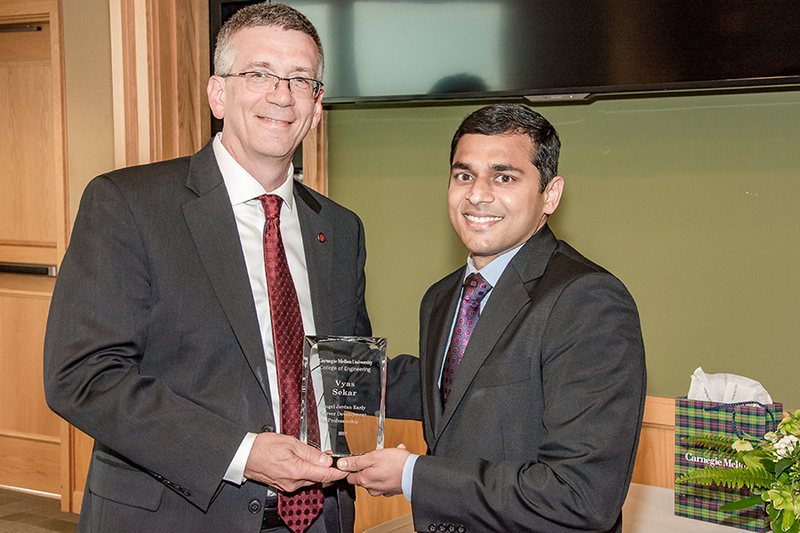 Recently, Assistant Professor of Electrical and Computer Engineering Vyas Sekar was awarded the Angel Jordan Early Career Professorship for his contributions in the academic and research sectors of Carnegie Mellon’s engineering department. The Department of Electrical and Computer Engineering created the Angel Jordan Early Career Professorship to honor and celebrate the undeniable impact that Angel Jordan (former ECE professor, CIT Dean, and University Provost) has had on Carnegie Mellon and the College of Engineering. Throughout his career, Angel Jordan helped transform Carnegie Mellon into a world-class educational and research institution. He not only conducted research on semi-conductors, integrated circuits, thin films, intelligent sensors, robotics, automation, and software engineering, but he also helped form Carnegie Mellon’s School of Computer Science, the Robotics Institute, and the Software Engineering Institute. Overall, Jordan has made countless contributions to the science and engineering fields while also devoting his career to advancing academic excellence and technology at Carnegie Mellon. In general, professorships help colleges retain outstanding professors, recognize the person for whom the professorship was named, and attract new faculty members conducting seminal research in their field. Representatives from the Department of Electrical and Computer Engineering created the Angel Jordan Early Career Professorship to bestow appreciation upon a young faculty member who has achieved great feats in the beginning of their career. By honoring a faculty member with a professorship, the ECE department indicates the top-notch quality of its instructors. Assistant Professor Vyas Sekar was recognized as one of these top-notch instructors because of his profound research on networking, security, and systems, and his undeniable teaching abilities.